Six years ago I made a proton pack for Halloween. You can check out the build process here. I made it mostly out of cardboard, foam, and random things from Home Depot and the Dollar Store. It was a fun foray into prop building and while I love the pack, it is pretty fragile. The base is pretty much all cardboard, and the pack has a duct tape look to it, mainly because there's a lot of duct tape on it. I wanted to build a pack that was more durable and looked a little more screen accurate. So I decided to build another one completely out of foam. 1. It had to be light, hence the foam construction. Proton packs are usually made of resin, fiberglass, or aluminum and can weigh anywhere from 35 to 50 pounds or more. Carrying that on my back all day during a convention is not appealing. 2. It had to house a backpack inside so that I had storage for things I bought at conventions, so I decided that the pack would split in two to access it. So to start, here's the bag I got to fit inside the pack. It has a flat, narrow profile and I got it on clearance at BestBuy. So I started building a box for the top half of the pack using foam floor mats. This actually took me three tries to get something that would work, a trend that would continue throughout this entire build. Cutting out circles for the cyclotron. I used foam building blocks to map out how all the pieces would fit together. Yes, that is a Pringles can at the bottom. The most time consuming part of building this from scratch is fabricating all the parts. Here's the gearbox. Along with the ion arm and booster tube. And now building the power cell. And the booster frame ladder which was just scored craft foam that I heated up to define the grooves better. I drilled holes into the cyclotron using a forstner bit. It works surprisingly well on floor mat foam. I then gave everything a good coat of plastidip and latex paint. At this point, I had pretty much run out of time to get the proton gun ready for San Diego Comic Con, so I decided to build one just by gluing foam building blocks together. I used my MattyCollector neutrino wand as a size guide and I liked how it turned out so decided to not even paint it. The last thing I was able to do before SDCC was to attach some wires and cables. My printer failed me and I couldn't get any labels on it. I was pretty disappointed that I didn't finish it in time. But I was pleased at how well it fit in my luggage! And honestly, I got a lot of positive feedback on the pack at SDCC. Here I am wearing it at a meetup with fellow propmakers. When I did come back home, I was able to finish the stickers and the n-filter at the bottom of the cyclotron. It's the thing that was originally a Pringles can, but I ended up using a poster tube. I even added some more embellishments like wires and switches to the neutrino wand. It's silly, but I like it! Now I had time to finally add proper scrolling lights to the power cell as well as the outside detail. I made room for a switch so I didn't have to open up the part to turn it on. Here's how the lights look without the cover. For the cyclotron lights, I took a very DIY approach and used blinking Halloween lights. I duct taped paper toilet rolls inside to hold them and aluminum foil to amplify the light. While I think it looks good, I still wanted to do more detail work. So I made a Clippard valve completely out of foam. And started attaching the final hoses and wires to foam "brass" parts I made. In retrospect, building a pack that split in two created a number of problems like how to keep wires together. So here you can see how I used magnets to make everything that needed to be detachable. Is connected by magnets too. 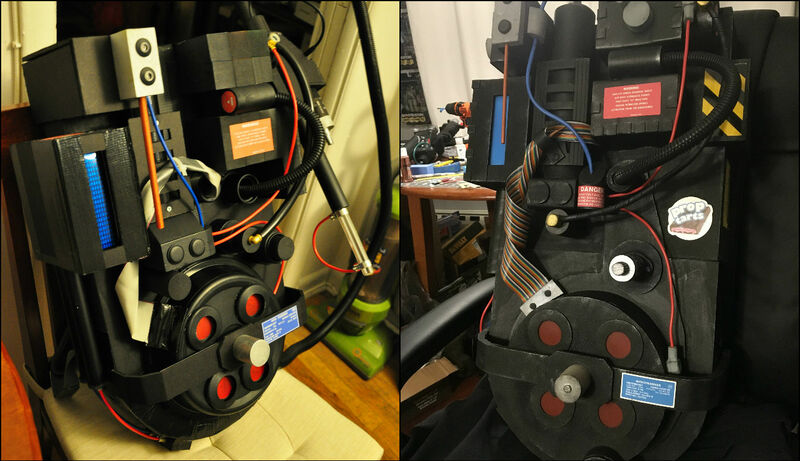 Here you can see the proton pack split in half. And it is attached by nylon webbing and plastic buckles that are hot glued in. And basically the pack is pretty much done! I still need to build a neutrino wand for this but in the meantime I attached this bracket. The Velcro was used to attach my silly foam gun to the pack. And now I can mount my MattyCollector neutrino wand to my pack! This project is by no means done. I still need to make a proton gun, and attach a hose from that to the bottom of the pack. I'd also like to put a speaker in here as well. But I've worked on and off this all year and I quite frankly need a break from this project! But I'm super happy with how it turned out. As far as materials go, this pack was very cheap to build, it only weighs about 5-6 pounds, and I always get a positive reaction to it when I go to conventions. If you have any questions on how it was built, just let me know in the comments! Happy crafting!